Canola is a type of rapeseed that has been bred to produce an edible oil for human consumption; organic canola meal can be used for feed in organic livestock operations. Organic canola acreage in areas of the United States and Canada where transgenic canola is widely grown has dramatically declined due to contamination issues; limited transgenic canola production in our region minimizes the risk of contamination and offers a unique opportunity for producers to capitalize on the demand for organic canola. Winter canola is produced in a similar timeframe as wheat in North Carolina and growers can use small grain equipment to grow canola, therefore minimal equipment investment is necessary to add canola into the rotation. Canola can be established using a planter, drill, or aerially broadcast; this allows flexibility with equipment at planting. Canola is a very small seed and should only be planted at a 1/4 to 1/2 inch depth. The best canola stands are achieved when canola is planted into a clean-tilled seedbed; no-till canola is possible but has additional management challenges. Growers that no-till canola into heavy residue should increase seeding rate 15-20%. Canola needs to be planted earlier than wheat; ideally canola should be planted by mid-October to ensure adequate fall growth prior to the first killing frost. From 2011 to 2013 we tested several row spacing (7, 15, and 30 inch) and seeding rate (3, 6, 9, 12, and 15 lbs/acre) combinations for organic canola production in Goldsboro, Kinston, and Salisbury, NC. Conventional canola planting recommendations are to plant at 4 to 6 lbs seed/acre on 6 to 8 inch row spacing. We wanted to determine how increasing seeding rates and widening row spacing to allow for between row cultivations would enhance weed control and affect canopy diseases. We found that in an organic weed control context, canola yield was generally maximized at low seeding rates across row spacings (3-6 lbs/acre).Canola yield increased slightly at higher seeding rates with the narrow row spacing, but declined as seeding rate increased in the wider row spacing. Growers planting on wide row spacing should use caution when increasing seeding rate beyond 6 lbs/acre as yield declines can occur from high interspecific competition. To our knowledge, there are not regionally-adapted, certified organic canola varieties available in the Southeast, however there are several non-GMO varieties that are well adapted for production in the region. Rubisco seeds is a supplier of non-GMO canola varieties in the region. We did not observe severe disease pressure in our canola trials, but we know that the Sclerotinia disease complex can reduce canola yield. Sclerotinia pressure is intensified under wet conditions; avoid poorly drained fields. As with all organic crops, synthetic herbicide use is prohibited in organic canola production. Using plant competition is an important component of weed control in organic canola production; canola is relatively competitive with some common winter weeds such as henbit and chickweed and if growers have weed pressure primarily from these species they have flexibility on row spacing selections to maximize yield. In our 2011-2013 organic canola trials, we observed slight declines in weed pressure as canola seeding rate increased, however this did not affect canola yield. Canola is plastic and can be competitive with some weed species at low seeding rates. If growers have severe weed infestations from hairy vetch, clover, or Italian ryegrass, widening canola row spacing to allow for between row cultivation can be important to prevent yield loss in organic canola production. 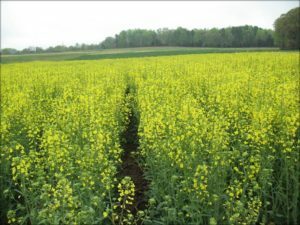 Canola does require 120 to180 lbs N/acre to maximize yield and requires a moderate soil pH (University of Georgia Canola Production Guide). A split N application at planting and again in the spring prior to bolting is often recommended. Canola is sensitive to boron (B) and sulfur (S) deficiencies; this is especially problematic on sandy soils. From 2016 to 2017 we conducted a study looking at fertility options for organic canola in Goldsboro and Kinson, NC. We evaluated the effects of poultry litter application rate/timing, added B, and added S on organic canola yield. Trials yields were between 25 to 35 bu/acre at each location. Two methods of poultry litter application were investigated: 4 tons/acre applied preplant only and a split application of 2 tons/acre applied preplant and 2 tons/acre applied in February prior to canola bolting. Canola yield was maximized when all litter was applied preplant, with a 4 bu/acre increase in yield compared to a split application. 60 lbs S/acre (gypsum) and 0.3 lbs B/acre (Borosol) were applied in mid-February and compared to no added B and S for canola yield. Adding these nutrients did not increase canola yield. These preliminary results indicate that canola fertility can be handled by one preplant application of poultry litter and that adding B and S in the spring may not be necessary to maximize canola yield. Harvesting is generally considered the most complicated part of canola production. Based on our experiences in North Carolina, canola is typically ready to harvest around the same time as wheat. Canola can be direct combined but determining the ideal harvest timing can be difficult. Canola is indeterminate and there is generally a short period between plants being too green to harvest and so dry there is significant shatter. Harvest should occur when approximately 85% of the pods are brown. We have growers that have harvested their canola using their small grain header and wheat sieves in their combine. 10% moisture is ideal for harvest and 7-8% moisture is ideal for storage. Italian ryegrass contamination of the canola crop can be a problem in situations where Italian ryegrass pressure is severe. Lodging can also be a problem for canola production, particularly when the canola is over-fertilized. Lodging is intensified at seeding rates above 9 lbs/acre. Previous research trials and production in the state would indicate that canola yields between 30-60 bu/acre (50 lbs/bu) are typically achieved. Please feel free to contact Chris (919)515-7597 (chris_reberg-horton@ncsu.edu) or Rachel (309)945-6752 (raatwell@ncsu.edu). • What Is All That Yellow?